The last few years seem to have witnessed a surge in the number of First World War memoirs that have been published as public interest in the centenary has grown and previously overlooked family records have been rediscovered. The quality of these memoirs varies, some limited to a few lines of diary entries, others furnished with more detailed memories written at the time or later on. Michael Weir Burns was custodian of many of his late grandfather’s possessions, including a series of metal trunks. Unopened and forgotten about for many years, when he did get round to examining the contents he was in for a surprise. Not only was his grandfather’s wartime uniform contained in the trunks, but also a personal diary, letters, photographs, and other mementoes of his time in the services. In addition the family still possessed his mother’s diary, as well as letters sent to and from Weir not only from his family but also other officers and soldiers. This is a fantastic archive and together combine to form a rich tapestry of information. The volume has been edited by Saul David and combines his narrative of the events surrounding Weir’s movements with extracts from Weir’s diary and many of the letters that he sent and received. Weir served with the 10th Battalion Argyll & Sutherland Highlanders, and after initial training was deployed overseas where the battalion received their baptism of fire at Loos in September 1915. After moving to the Ploegsteert sector the battalion were later in reserve on the first day of the Somme, but took part in the fighting for Longueval and Delville Wood on 14th July. Weir provides a detailed account of the action that day, for which he was later mentioned in despatches. However in October 1916 Weir’s luck ran out when he was wounded and sent home. Despite longing to return to active service he spent the rest of the war training potential officers and serving with the Reserve battalion. However he continued to work for the War Office until his demobilisation in 1920, dealing with the consequences of the Russian Civil War. He continued to correspond with the officers and men of his battalion whilst at home, and many of these letters are included. The text is accompanied by some splendid pictures of the letters and Weir’s other effects, hand drawn maps of Ploegsteert and the Somme, pictures from Weir’s own album, and photos of some of the officers he served with. As a source of information about the battalion the book is extremely useful, giving an insight into its actions and movements as well as providing further details of the fate of many of those who lost their lives. 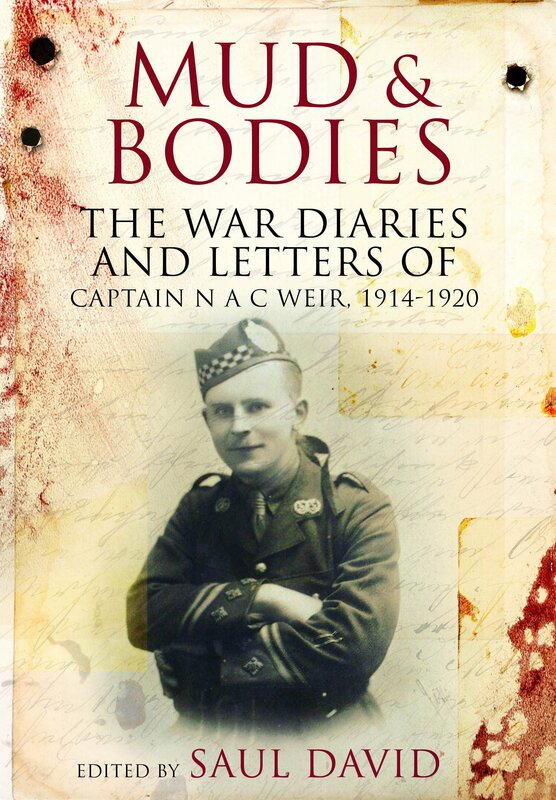 Overall ‘Mud and Bodies’ is a valuable addition to the memoirs available and we must be grateful to Weir’s grandson for keeping possession of such a rich archive of information.